Ruby Shoo Willow women's court shoe. 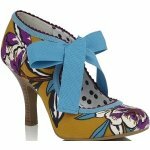 An elegant and classy style with brightly printed uppers and a statement ribbon ankle tie. A classic, retro look that is guaranteed to have heads turning. The ribbon ankle tie allows for a secure and adjustable fit. A style that can be worn both casual or dressed up for evenings. Matching handbag also available, please see Ruby Shoo Santiago. Heel height 9cm.